The TriDerma Everyday Bruise Relief Fast Healing Cream is a dependable cream formula that helps you heal from your wounds such as bruises from the everyday small accidents and from bumping into objects while passing them. The bruise relief cream helps improve healthy and natural healing from blemishes while infusing the hurt area with a soothing and non-irritating formula that includes beneficial elements such as Aloe, a great product that reduces itching and calms the skin while also providing a minimal amount of pain relief. 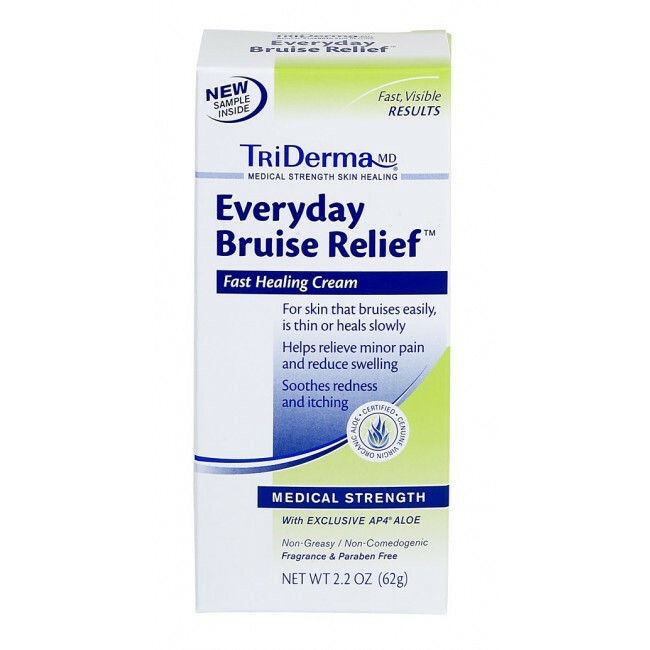 The TriDerma 2.2 Ounce Fast Healing Everyday Bruise Relief Cream is made to help heal faster than the body naturally can, at a faster pace you are able to get the bruising to go down and get you back to your daily and regular activities. While the formula is fast acting, continued use is required to keep the cream working to reduce your bruise; do not stop once you think you are fine, continue use as recommended. Symptoms such as itching, redness, and swelling from these different sorts of injuries you may have, are all treated and combated against with the active ingredients from the bruise relief cream. The first thing the cream works to do is to stop the itching in order to give you comfort back then works down to help reduce swelling and redness until it is completely gone. The Bruise Healing TriDerma Cream can be used for more serious bruises such as surgery. The cream does offer enough healing agents to aid your wounds without leaving behind a greasy trail; even if you think the cream is off, it still provided effective relief. Ingredient Formula: Aloe Barbadensis (Aloe) Leaf Juice*, Dimethyl Sulfone, Arnica Montana (Flower) Extract, Isopropyl Palmitate, Caprylic/Capric Triglycerides, Cetearyl Alcohol, Polysorbate 60, Beeswax, Tocopheryl Acetate (Vitamin E), C12-C15 Alkyl Benzoate, Allantoin, Behentrimonium Chloride, Cyclopentasiloxane, Cyclohexasiloxane, Hydroxyethylcellulose, Sodium Hydroxide, Phenoxyethanol.